9th Sept, Wed, a SS day, ES has hit the projected level of 1034, the 3 day Rally level is around 1040. 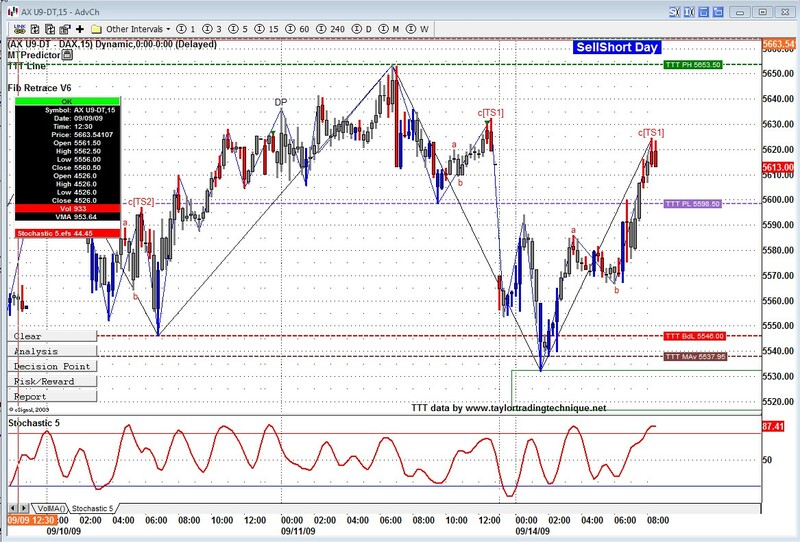 I missed it but one of my friends did take the long on TF near the open at 574.2. It was the correct way to trade TTT today since the 3 day rally was pretty small at that time. 2. However once you recognise the nature of the market ie. trending up as yesterday, do you not have any strategy to enter the market midway ie. after its initial entry point is missed. Today is Buy Day, premarket prices are heading up, could setup shorting opportunity first. If we open below the Buy day low then yes I am deffinatly looking for any excuse to go long. It is harder to jump in on a trending market once you have missed the start, unless there is some correction. Nothing jumped at me yesterday to help with that. Today like you said we could have short and long opportunity, I just hate rollover days. However on Dax and Ftse, the prices dropped below BDL and created a BV long opportunity. Looking at the DAX it opened above Bd Low so You had a positive 3 day rally even if not strong. Then it went below BdL also putting TVGR in effect. It bounced on the DP with divergence and went to close the gap making for a nice trade. But definatively not a text book TTT trade. In Friday's letter to subscribers I said "Monday will be a SS day. We should probably retest the highs before a decline starts." This morning on CNBC and other news letters they were all forcasting a big down day. On friday, TTT said Monday would be a good day to go long whereas all the smart people on TV were saying to go short even after the market opened and started to rally. So far TF and NQ even made new highs and ES is knocking at the door.